Free delivery within 15 km of Tullamarine or South Kingsville. Hygienic: cleaned and sanitized. Easy to clean. Convenient: All that is required for bedding is a pillow case to cover the mattress (not included). Convenient height. 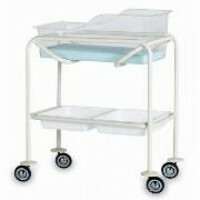 Bassinet is able to be elevated which is great for reflux babies. Confidence: With clear plastic walls it makes it easy to view your baby at all times (no need to get out of bed at night). Peace of mind.